The heater and the defroster are separate units which may be operated together or independently as desired. The heater and defroster installation is an automatically controlled hot water system which uses forced air to insure positive distribution of heat. 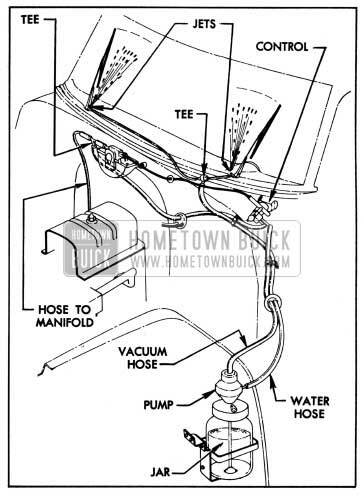 The hot water supply is taken from the radiator thermostat housing on the outlet side of engine water pump and is returned to engine cooling system on the inlet side of water pump. Through connecting hoses, the water pump circulates hot water through a temperature control unit on the dash, the defroster unit core mounted on the cowl, and the heater unit core located under the front seat. Outside air is picked up by a large duct at a point just behind the radiator grille and conducted in a nearly straight line to the defroster core. Passage of air through the defroster core is controlled by a manually operated valve connected by a Bowden wire to a knob on instrument panel. The outside air is heated in passing through the core, and enters the body through openings along the base of the windshield. An electric blower mounted in the air duct forward of the defroster core and controlled by a switch on instrument panel provides forced air flow which is needed at low car speeds. At high car speeds, forward motion of the car supplies the necessary flow of air through the defroster core, so that the blower may be turned off. The heated air entering the body at base of windshield flows upward against the windshield, defrosting it, then flows rearward into the body at a high level. At rear of body the air is pulled downward and reheated by the recirculating underseat heater. The underseat heater contains a hot water core and an electric blower controlled by a switch on instrument panel. This system provides maximum comfort since heated air is circulated both at shoulder level and at floor level. See figure 11-1. The heated air circulated in the body is held to a uniform temperature through the action of the heater temperature control mounted on rear side of cowl. The temperature control contains a thermostatically actuated valve which automatically regulates the volume of hot water flowing through the heater and defroster cores in accordance with the requirements for maintaining uniform body air temperature. The control may be manually adjusted for the body air temperature desired by car occupants. On first Series 40, the defroster air valve is operated by a knob, marked “DEFROST,” located below center of instrument panel; the defroster blower is controlled by a switch, marked “BLOWER,” mounted on the radio speaker grille. On later Series 40 and all Series 50-70, the defroster air valve control and the blower switch are combined in one unit mounted on the radio speaker grille. Pulling out the control knob, marked “DEFROST,” opens the air valve. Turning the knob clockwise turns on the defroster blower. The heater blower is controlled by a separate switch, marked “HEATER,” mounted on radio speaker grille. When floor level heating is desired the heater blower is operated by pulling the switch knob out. The heater temperature control is manually set to the desired body air temperature by turning the control knob, marked “WARMER,” located below the instrument panel on right side. Turning control knob clockwise raises the temperature level and turning it counterclockwise lowers the level. Once set for a desired air temperature the control will automatically maintain this temperature without further adjustment of the control knob. When the car is cold the temperature control valve stands open to permit maximum flow of water through the heater and defroster cores. As the body air temperature comes up to the level for which the temperature control is set the valve operates to reduce the water flow and maintain the desired air temperature. Since the air temperature will come up to the level as rapidly as existing water temperature will permit it is unnecessary and undesirable to attempt quick warm-up by manipulating the temperature control knob. The last few degrees of motion of control knob in the full clockwise direction cuts out the automatic control and holds the control valve wide open to give maximum water flow with consequent maximum heat. This feature is to provide unrestricted flow of hot water to the defroster core when maximum defroster capacity is required for de-icing windshield. At this time the temperature of the car may be reduced by turning off the heater blower. Hot water flow through the heater and the defroster cores is completely shut off by a full counterclockwise rotation of the temperature control adjusting knob. This shuts off all heat when not desired, such as for summer driving. This feature eliminates the need for a shut-off valve in water line at engine. When heating system is in operation a front door ventilator should be opened about 1/2″ to let out old air. The opened ventilator should be on opposite side from which wind may be blowing. Summer ventilation is provided by the defroster inlet duct and a similar duct on left side of car. Both ducts open into the body at the cowl and the flow of outside air into the body is controlled by a valve in each duct. Each valve is operated by a Bowden wire attached to a knob, marked “VENT,” located on radio speaker grille (below grille on first Series 40). Summer ventilation with outside air may be obtained by pulling out either or both “VENT” knobs. The temperature control knob should be turned fully counterclockwise to shut off water to the defroster core and the defroster air valve should be closed. For additional comfort in warmest weather while car is stopped or moving at low speed, forced ventilation may be obtained by turning on the defroster blower. NOTE: To keep out offensive traffic odors and exhaust gases when traveling in congested traffic or when parked behind a car having its engine running, all ventilator and defroster control knobs must be pushed forward to close the valves, and the defroster blower must be turned off. Avoid inhaling exhaust gases when any concentration of these is present in the air, i.e., in a garage, in congested traffic, or when stopped closely behind a vehicle with its motor running. Exhaust gases may have strong odors which normally should give warning of their presence. However, the exhaust gases from some vehicles may not be noticeable under certain conditions and the senses of people react differently. Exhaust gases contain a percentage of carbon monoxide which is a poisonous gas that, by itself, is tasteless, colorless, and odorless. The heater and defroster blower motors are supplied with current from the “1950 Buick Accessories” terminal of the ignition switch. The supply wire extends from the ignition switch to the fuse block under the cowl where a fuse is located to protect the circuit. Wires from the fuse block connect to the heater and defroster switches and from the switches to the motors. See chassis wiring circuit diagrams in Section 10-J. 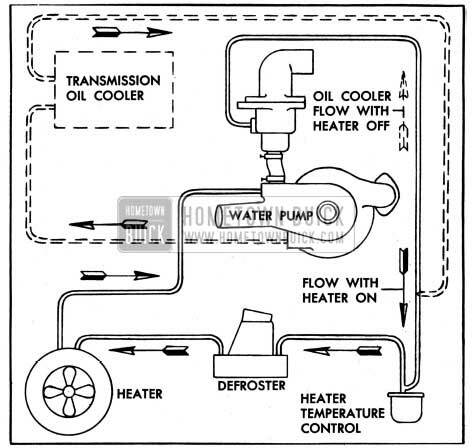 Figure 11-2 shows the heater and defroster hose connections, also the connections to the transmission oil cooler which is used only on Dynaflow cars. When hoses are disconnected for any reason they must be reconnected as shown to obtain proper circulation of water through the various units. The automatic windshield washer installation includes a washer assembly, combination windshield wiper and washer control, a spray jet mounted on each windshield wiper transmission, and connecting hoses. See figure 11-3. The washer assembly consists of a vacuum operated water pump and a glass water jar. The assembly is mounted in a bracket attached to the left front fender skirt where it is accessible with hood raised. The inlet at top of pump is connected by a rubber hose to the control mounted on left side of instrument panel, and the control is connected by hoses to the intake manifold. The outlet at side of pump is connected by hoses to the two spray jets located at lower edge of windshield glass. See figure 11-3. The washer is operated, with engine running, by pressing the small button in center of the windshield wiper control, holding for a few seconds, then releasing the button and turning windshield wiper control to “ON” position. Manifold vacuum actuates the washer pump which draws water from the jar and forces it through the jets where it is sprayed on the windshield glasses in the path of the windshield wiper blades. Washer will operate for several seconds before shutting off automatically. When the washer is filled for use during seasons when freezing of water may occur, Windshield Washer Anti-Freeze Solvent No. 980740 should be used. Do not use water containing alcohol or other anti-freeze materials as damage to car finish may result. If the windshield washer does not operate when control valve is used as instructed, check to make sure that water is in the jar. Examine all hoses for leaks or sharp bends, and check hoses for correct connections as shown in figure 11-3. The windshield washer jets have a swivel base and are locked by a jam nut. If the water stream is not properly directed upon the windshield glass its direction may be readily changed. Loosen jam nut slightly, turn jet with a screwdriver as required and tighten jam nut. 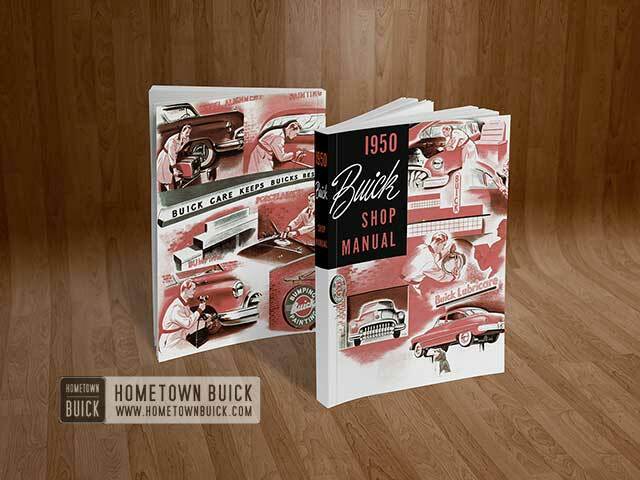 Back-up lamps are a factory installed 1950 Buick accessory. The installation consists of a lamp mounted in each rear bumper guard and a switch mounted on the lower end of steering column. The lamp and switch circuit is protected by a fuse on the fuse block under cowl. The back-up lamps are controlled by the ignition switch and the back-up lamp switch. When ignition switch is in the “ON” position, the lamps will light automatically when the transmission control lever is placed in the reverse position. The lamps will not light when control lever is in any other position, provided the switch is properly adjusted. This is a legal requirement in many states. The adjustment of the back-up lamp switch should always be checked after any adjustment of transmission shift controls, or whenever back-up lamps fail to light in Reverse and the bulbs and fuse are okay. The back-up lamp switch on cars equipped with syncro-mesh transmission is located at the lower end of steering column jacket and is operated by the transmission control shaft lever when placed in reverse position. 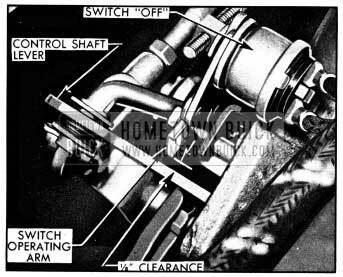 Adjust transmission shifter and selector rods as described in paragraph 4-9. Place transmission gear shift lever in reverse. Loosen hex head cap screw on switch operating arm and adjust length of arm until end of arm extends 1/8″ to 3/16″ beyond front edge of control shaft lower lever. See figure 11-4. Tighten switch arm screw securely. Place transmission gear shift lever in second speed position and check clearance between end of switch operating arm and rear edge of control shaft lower lever. The clearance will be approximately 1/8″ if switch is properly adjusted. See figure 11-5. The back-up lamp switch on cars equipped with Dynaflow Drive is mounted on the flange at lower end of the steering column jacket so that the switch operating arm is operated by the transmission control shaft lower lever. 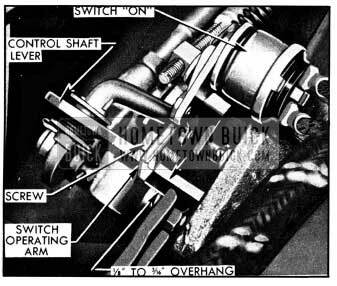 Check the adjustment of switch by placing transmission control lever in Low (L) position, then checking clearance between switch operating arm and lower edge of control shaft lower lever. Correct clearance is 0 to 1/16″. If the specified clearance does not exist, loosen the two switch mounting screws and move switch up or down on mounting bracket as required to obtain clearance, then tighten screws securely. Switch screw holes in mounting bracket are slotted to permit this adjustment. See figure 11-6. The safety (spot) light is connected to the No.3 (taillight) terminal of the lighting switch so that the light may be turned on only when the lighting switch is in the “parking” or “driving” positions. The wiring is protected by a fuse located in a splice type fuse holder in safety light lead near the lighting switch. Turn lighting and safety light switches to “off” position. Separate safety light lead at fuse holder, remove fuse, and work lead free of supporting clips on forward side of instrument panel. 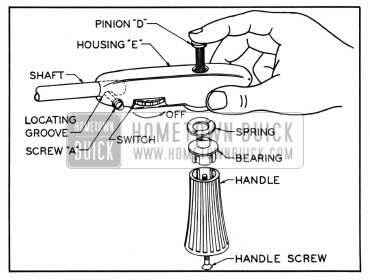 Loosen screw “A.” Remove handle screw, handle, bearing, and spring then push pinion up and remove it. Remove screw “A” and pull housing from shaft. See figure 11-7. Loosen the nut on friction bracket, remove mounting bracket attaching screws and remove safety light from car. 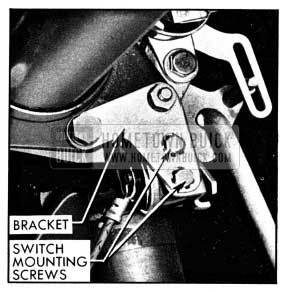 Make sure that mounting bracket fits snugly into the lamp arm and is retained by the small spring on shaft. A small tang of the spring fits into a hole in shaft to hold mounting bracket in place with the correct tension. Place the gasket over shaft and against mounting bracket. Rotate lamp head until racks protrude from shaft to equal lengths, then tie rack ends together with string or rubber band. Put shaft through hole in door panel and through the friction bracket on inside of door. Install mounting bracket attaching screws, taking care to tighten screws alternately a little at a time until both are uniformly tight. Be sure to turn switch to “off” position to avoid damage to switch contacts. Remove string or rubber band from racks then slide housing into position on shaft. Do not force housing into position as driving racks may be damaged. Start screw “A” in housing but do not tighten. Screw should be in approximate center of locating groove in shaft. Insert the pinion between teeth of driving racks using care to start pinion in center of hole in housing. Pinion should slip into place easily under very light finger pressure. If more than light finger pressure is required, pinion is not located in center of hole in housing. Install spring, bearing, handle, and handle screw. Tighten screw securely then rotate handle to see that pinion and racks move freely. Finally, tighten screw “A” securely. See figure 11-7. Make sure that safety light lead is looped at door hinge so that it will not be kinked or strained as door is opened and closed. Attach lead to four wire clips on forward side of instrument panel, install fuse in holder and connect fuse holder together. Check to make sure that safety light lead is securely attached to No. 3 terminal of lighting switch. Tighten the nut on the inner bracket to adjust the tilting of lamp head and rear view mirror to the owners individual driving needs. When the lighting switch is in parking position, either the parking lamps or the auxiliary lamps will burn, depending on the position of the auxiliary light switch. During the installation of the auxiliary lamps, the white wire to the parking lamps is disconnected from the No. 2 terminal of lighting switch and connected to a 3¥2″ extension attached to one terminal of the auxiliary light switch. The other terminal of auxiliary light switch is connected by a jumper wire to the No. 2 terminal of lighting switch. The auxiliary lamp wiring is protected by the thermo circuit breaker on the lighting switch, and also by a 14 ampere fuse mounted on the lamp switch. The auxiliary lamps must be properly aimed, and should always be checked after any work on the front end sheet metal assembly. The following procedure covers proper aiming of each lamp individually. Place car on a level stretch with a light colored surface or aiming screen twenty-five feet (25′) ahead. Draw a horizontal line on this surface four inches (4″) BELOW the level of the fog lamp center. See figure 11-8. Use a piece of masking tape to mark the exact centerline of the rear window. Sight through the center of the rear window over the radiator ornament to determine the vertical centerline of the car and draw a vertical line at this point. Place a vertical line the same distance to the left or right of center as the lamp is from center of the car. Aim the lamp (without removing lens) so that the top of the beam is at the horizontal line, and centered sideways on the axis of the lamps, regardless of its position to the left or right of the car. After the lamp has been properly aimed, tighten the lamp nut securely.